I have a special layout for you for a challenge I'm hosting. Leave a comment below for a chance at a prize and get an extra chance by playing along with the challenge. Create a page telling a love story - just not your love story with your significant other. Make your page about another relationship, maybe parent/child or you and one of your siblings. Or you can do as I have and create a page to tell someone else's love story. My page is about my aunt and uncle who were married 72 years. They married just a couple of months after Pearl Harbor and only a few days before he was deployed. The built their life together back here in North Carolina as dairy farmers, parents, and active members of their church. My aunt was a remarkable woman and I was blessed to have them in my life. The circle of hearts die cut shown above and in the video is available here in SVG format: Hearts Joined In Circle Ungroup the design to get to the heart in the center. That is the one you can cut 8 times to create the hearts to fill in if you wish. You don't have to use the cut file for the challenge. Though you may take up another part of my layout and that was to use non-traditional Valentine colors. I used Authentique's Nestled 6x6 pad which is actually a fall collection. So have fun creating a page to tell use a love story and share a link to your page in the comments. I look forward to seeing them! Prize contains 1 6x6 pad from Prima called Something Blue, Stampin' Up! 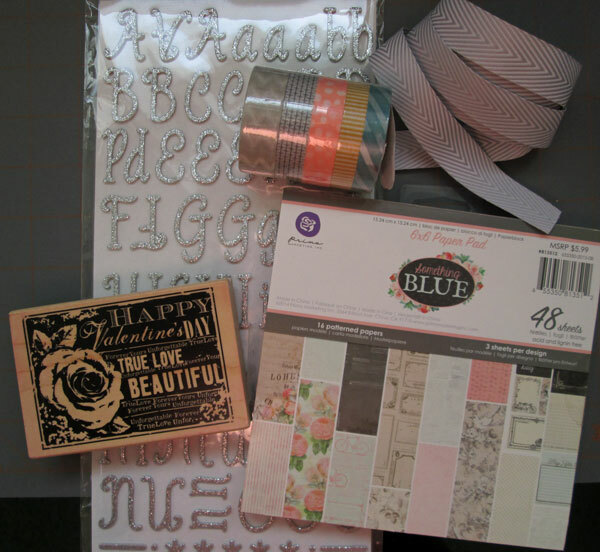 Washi tape (remember this from my shopping video), Silver foam letter stickers, 1 1/2 yards gray chevron ribbon and one Valentine stamp. The stamp is from my collection but all other items are brand new. Giveaway details: The giveaway is open to anyone who wishes to leave a comment. You may leave one additional comment with a link to your challenge project for an extra chance to win. Giveaway chance closes at 6 p.m. ET on Saturday February 20, 2016. Randomly chosen winner will be posted on this blog by Sunday the 21st. Check back to see if you have won. The winner must email me by the following Wednesday. If I don't hear from the winner, I'll draw another commentor. While you are visiting, check out info on the Sketchbook here. 40 scrapbook sketches for only $6! I have 3 on-line self-paced scrapbooking classes one also on the classes page. Thanks for visiting! Another layout I need to steal.....love your work. What a great story. Love the way you have used the hearts diecut. Thanks for the giveaway. Look forward to seeing more of your layouts. awesome layout - love that diecut! lovely layout! Thanks for the opportunity of the giveaway! I am working all weekend, so I won't get any pretty stuff done. But I may have to scraplift your layout if the kids have a snowday Monday. Fantastic LO for a fantasist life story! 72 years, how wonderful?! Love your LO, great hearts and love the fall colors. I think they are perfect for anytime of the year! Thanks for the chance to win. Love you page and the tutorial. I have a love story I want to put on a page or two. My dh has fallen head over heels for our dd's soon-to-be adopted almost 3-year-old son. The problem is that since the adoption is not yet finalized I cannot post any photos of the little guy on line. I completely understand. I do see people sometimes post layouts with the photos covered. If you don't want to post, just let me know you did the page and I'll give you credit for an entry. Thanks. Beautiful LO Lisa and such a wonderful love story. I hope I can take part in this challenge! I have a guest staying this week which might limit my craft time a bit though! love your layout... putting it on my to do list when I get chance. thanks for a chance on your giveaway. I stumbled onto your site. It quickly became a favorite. Thanks. I really like the different color scheme for a love themed layout, definitely plan to try this out. Congratulations, Anna! You are the winner of the Valentine giveaway. Please email me by Wednesday Feb 24. Thank you. Lisa, I love all your videos. I look forward to Tuesdays. I love the layout about your aunt and uncle. Lisa, I love your videos and your layouts. 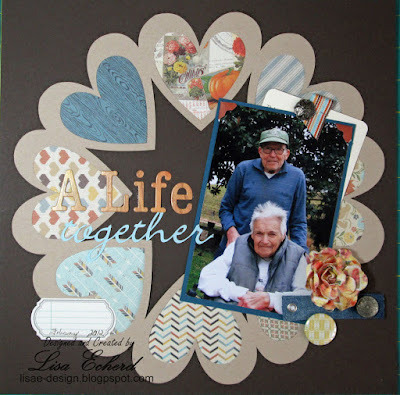 What a beautiful love story to scrapbook. Lisa, great video & layout! I can't wait to use my new Cameo & cut out that template! Thanks for the inspiration! Great video and page Lisa!